Crafting and participating in artworks with your children can be a good past-time to create a bond with your kids. We all know that when kids make art, it promotes creativity and if you are present to induce and motivate the creativity of your kids, nothing can be better than that. >Provides an Outlet for Emotions: Being creative with your children allows them to definite themselves through art. When creating projects, allow for some areas where the children get to decide what type to make or how to decorate something. They will have a positive outlook on life because they won't repress emotions or hide them. >Self-esteem and self-expression: Grasping skills, finishing art projects and learning to express themselves in new ways helps kids gain confidence and perseverance. >Visual processing and memory: Painting, drawing and sculpting develop visual-spatial skills in kids. These skills help kids analyze what they see and make choices based on visual information. Creating arts with your children can help to boost their memory, mental flexibility and self-control. >Associating a Positive Response to Learning: Crafting with children surely teach them something with each craft. Crafting with your children allows them to associate crafting with learning, and in turn learning with fun. >Bonding: Working with your children on crafts will enhance bonding between the child and parent. It allows you to work composed with them to produce something fun and beautiful. 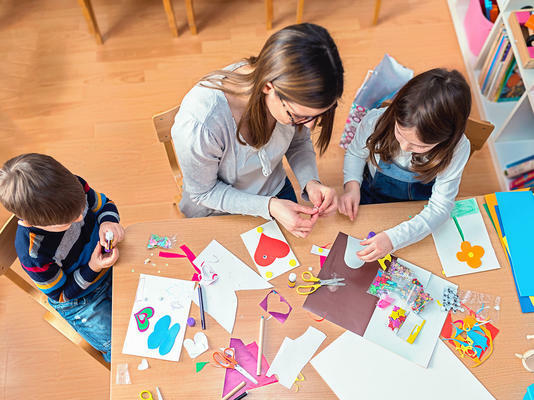 Crafting with your kids can grip your bond with your kid stronger than ever. So, now you know the benefits of making crafts with your children.